A few years ago, companies seeking technology and computing support utilized the traditional route of purchasing equipment and hosting that equipment on premise in their office locations while paying for support separately. When service was needed, the provider would come on-site to the location, charge an exorbitant hourly fee, and perform the change or update and leave. Besides the time lost on waiting for someone to show up at the physical location, other issues arose as costly IT breakdowns became the norm for many businesses, and time and billing became a questionable expense. Today, the new breed of IT companies and consultants are no longer nickel and diming customers with technology and computing support. Instead a company like ours hosts everything you need off-site, with all physical devices and support provided remotely. 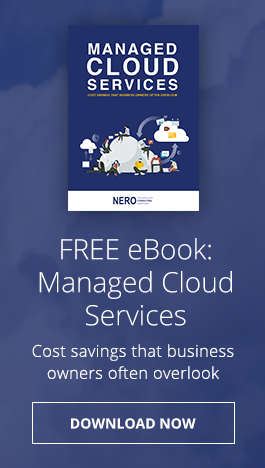 With Nero Consulting maintaining your technology, you will never need to think about IT. You can rest assured that your computers will just work, and that a remote support staff is proactively monitoring your IT 24x7. A virtual IT department with service offerings located in the cloud is the new technology solution for today’s small and medium-sized businesses! To ensure complete transparency of our Managed Services, all our customers are provided with real-time updates of network activity, events, and remediation. We also provide month-end reports which we email to you.